Samsung is the Korea’s largest conglomerate and consists of more than 60 companies. The revenues in 2012 were USD 268 billion, which corresponds to 23% of Korea’s GDP. The largest business area is Samsung Electronics (61% of revenues), with products such as mobile phones, tablets, television sets and semiconductors. Apart from Electronics, Samsung runs many other businesses ranging from ship building to insurance, financing, hotels and hospitals. As part of our Korea Business Programme, we visited Samsung Engineering. The company has 8,000 employees and design and construct processing plants, such as refineries, desalination plants and power plants. At Samsung Engineering, the visit was hosted by Mr. Dae-Yung Ahn (fifth from left), Executive Vice President, Corporate Strategy and Planning Division. Mr Ahn has a broad experience from Samsung and has been working in the Chairman’s office. The visit at Samsung Engineering was made possible thanks to Prof. Sang Chul Park (third from left) who is a professor at Korea Polytechnic University and a visiting professor of International Business and Trade at our School. 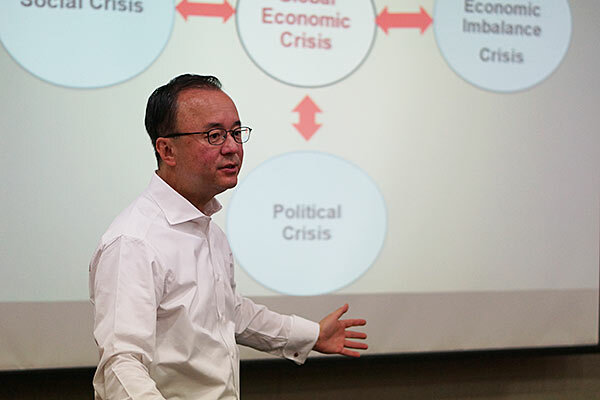 Professor David Kim, with a background in the American financial sector gave an overview of the World economy. He showed how much of growth since the 80s has been fuelled by borrowing and budget deficits. Therefore, it may become difficult for the world economy to recover to a sustained growth. 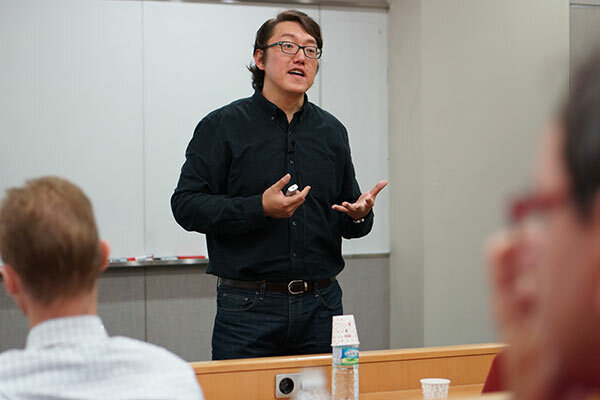 Prof. Sung-Joo Bae presented how technology was transferred from the western world to Korea allowing Korean companies to first acquire manufacturing process knowledge and then work themselves “upstream” to also acquire product knowledge. 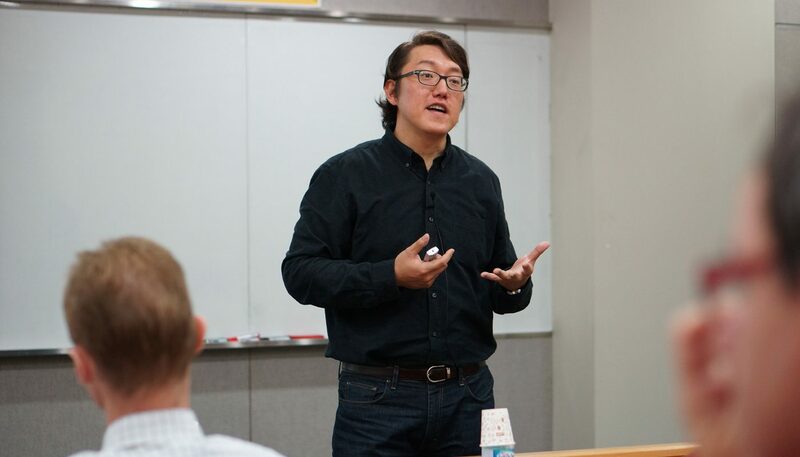 Today, Korean companies are often world leaders in their product niches. Samsung is number one in businesses such as LCD displays, smartphones and memory chips. 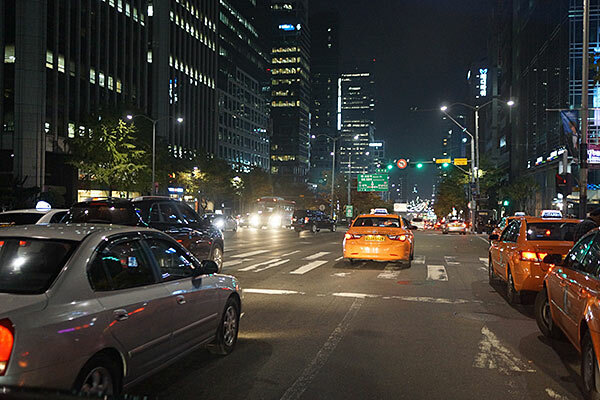 Cars come to life at Hyundai Motor Company Our discovery of Korea continues. 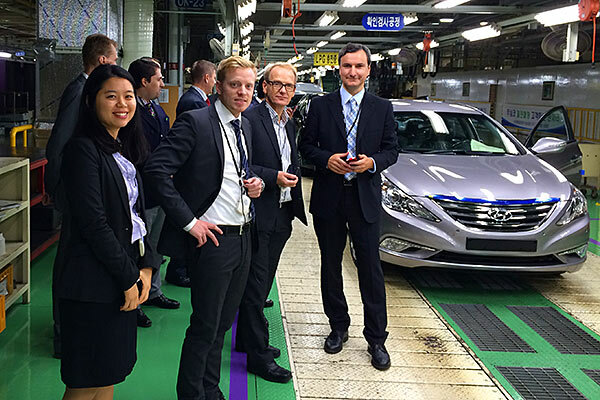 Today, we have had a combination of academic lectures and a field trip to a Hyundai manufacturing plant.